Ross County striker Brian Graham. 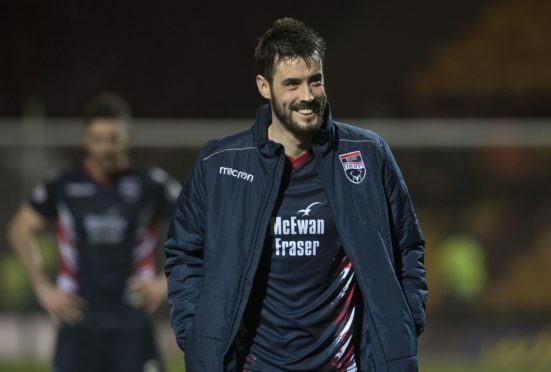 Victory for the Staggies would put them 14 points clear at the top with eight games to go, leaving an almost insurmountable task for the Arabs in their quest for promotion. County have made great strides in trying to make an immediate return to the top flight, following relegation at the end of last season. United, by contrast, have been trying to get out of the second tier since dropping down in 2016. The last time the two sides met at Tannadice County ran out 5-1 winners in Csaba Laszlo’s last game in charge. A much-changed United team – helped by a hefty January recruitment drive – will take to the field tonight knowing they are in must-win territory for their own aspirations. Graham said: “We’ve opened up the gap and they’ll probably see it as a must-win game. That’s the nature of the beast. We go there with a gameplan and can hopefully come away with three points. “I think they’ve brought a full new team in during January so obviously Robbie Neilson wasn’t happy with something – and he’s changed it. “We can’t really focus too much on what has been going on down in Dundee. We have to keep the togetherness here and keep working away to get results. That’s the plan. “We’ve done our homework on them and we know what’s expected of us. We know how they’ve been playing recently. We know what we’re up against. For a long spell of the season Ayr United had set the pace at the top of the Championship, however a run of three straight defeats has dropped them to third in the table. County’s run of six straight wins has given them a sizeable, if unexpected, cushion. Graham added: “We didn’t really expect to create the kind of gap we had but, with the run we’re on we’ve been picking up results while sometimes not playing particularly well. “The day at Partick Thistle, I feel, was crucial – 2-0 down at half-time and we came back to win 4-2. Other teams drew or lost.